Tango from Buenos Aires to the world. Professional dancers and instructors in New York City. Shows & Theater performances for events. Group and privates Tango Lessons. We just booked them for a short exhibition at our weekend social dance and they did a splendid job. We got marvelous feedback across the board. I recommend booking them for sure! Thanks Greg, your event was beautiful and you are a great host! We enjoy dancing for all your people, hope see you all soon! - A professional Tango Show by a couple of Tango dancers from Buenos Aires (Argentina). - Costume changes, theatrical gala dresses, traditional attire. - Traditional salon tango with exhibition elements. 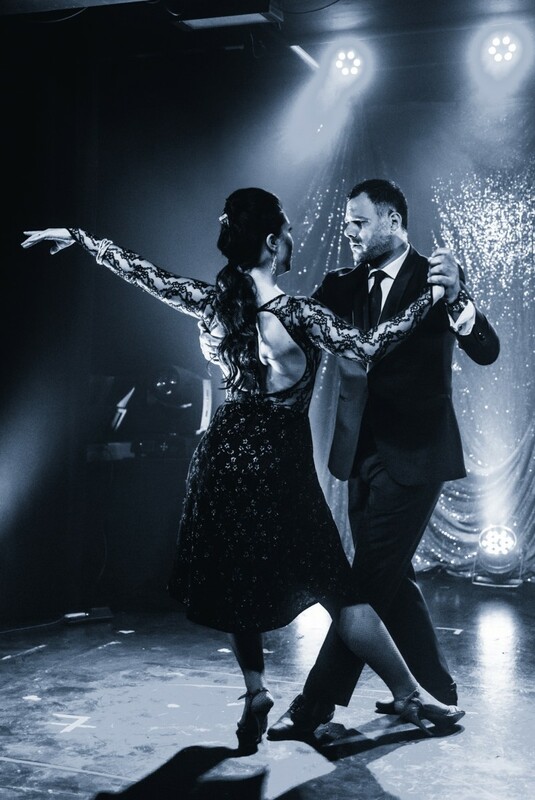 - Like an optional you can add a short Tango lessons for the guests, they will interact learning the basic tango steps and sharing with the dancers. - We offer add Singer and musicians to the performance. As a professional tango dancer, Azul IF has dedicated her artistic career to representing her Argentinean roots around the world. With a foundation in ballet, jazz, and aerial dance, Azul has taken part in numerous theatrical musicals in Buenos Aires and has travelled throughout Argentina on various tours. She has danced to honor prominent celebrations throughout the city of Buenos Aires, such as La Noche de los Museos, The World Tango Festival & World Cup, and the National Day of Tango in addition to various other festivals. She has also been on television shows and publicity campaigns for a number of brands, including Coca Cola, Visa, Sheraton, Hilton, and Mercedes Benz to name a few. Her performances span the Americas, Asia, and Europe. In the United States, Azul was recruited by the Argentinean Embassy in Washington D.C. to represent traditional Argentinean tango for the last 4 years. Other notable presentations include, the United States Department of Agriculture, the United Nations, the 9th Avenue International Food Festival, and NYC's Hispanic Day Parade (along Fifth Avenue) in Manhattan. Three of Azul’s most recent theatrical presentations of the last year, include her participation as part of Hector Zaraspe’s Zaraspe Dance Troupe in the world premiere of the ballet Estancias in Oregon, accompanied by the Eugene Symphony Orchestra, a season of "Afrotango" at Thalia Theater in New York City, a tour throughout China in Polly Ferman’s Glamour Tango and a Japan Tango tour among others. Rubén Porto is a traditional Argentinean tango dancer born in the neighborhood of Caballito in Buenos Aires. Admirer of tango music and compositions as a cultural expression, he has dedicated his life to the dance and continuing with his father’s tango legacy. He has participated in diverse exhibitions of Tango Salón and has taught tango to various students of all ages. In the last six years, Rubén began working with Azul IF with whom he now maintains an artistic career. Together they have danced at the Argentinean Embassy in Washington D.C., the United Nations, the United States Department of Agriculture, Saint Peter’s Cultural Center of Manhattan, Argentine Cultural Center, Long Beach Public Library in New York, and festivals in New York City, such as the NYC's Hispanic Day Parade (along Fifth Avenue) and the Ninth Avenue International Food Festival, among various others. ​Additionally, he has done presentations at various milongas, restaurants, and events accompanied by renowned tango musicians. His last tour included Argentina, Spain, France, Italy, Portugal, China and Japan. Also his most recent theater season was "Afrotango" at Thalia Theater in New York City. - A non slippery floor. - A private room of space for costumes changes.